It’s the end of the week which means that today is the day to finish the table runner so it can adorn my table over the next couple of weeks for the holidays. 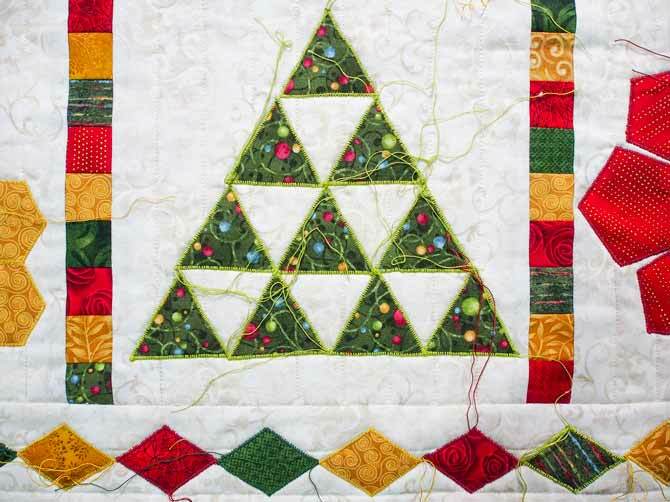 I’m going to show you 3 ways to embellish the charming Christmas runner. 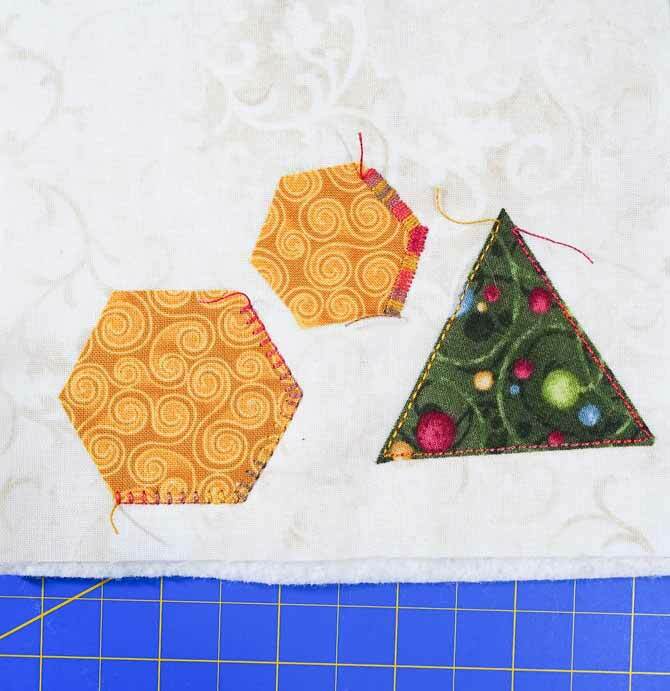 Yesterday I used the mini templates to create applique shapes for the runner – a wreath from the pentagon, a tree from the triangle, a snowflake or two from the hexagon and a ribbon border from the diamond. Today I’m going to finish up the runner with some stitching and other embellishments. The applique is fusible raw edge applique which means that the edges need to be secured down with thread otherwise they’ll fray over time and especially if the piece is ever washed. And besides the applique looks much better when the edges are finished with stitching. Satin stitch which is a very tight zigzag stitch. This stitch can be done with the feed dogs up or down – so either regular sewing or free motion. My favorite method is free motion. Blanket stitch which is a great stitch for securing raw edge applique. Straight stitch which is just a single stitch line very close to the edge of the applique shape. Not my favorite method as the edges still have a tendency to fray over time. Embellishing the designs with buttons or beads will add some sparkle and bling to each design. Adding colorful yarn or cording to the piece may add some interesting detail to the design but it will have to be well placed to enhance the runner. First, I’m going to stitch down the applique and see how it looks and then decide if I need to add any other embellishments to it. I chose to do free motion zigzag as I’m stitching with a 12 weight cotton thread to match the fabrics in the wreath, tree and snowflakes. The diamonds I have matched each one with the appropriate color of thread. The heavy weight thread certainly adds a great outline to the shapes and now I have even more work to do getting rid of all those thread ends. I’ve placed some beads on the three center designs and am quite happy with how they look – they certainly give the piece a bit of sparkle. Oh boy I’m going to be sitting in front of the TV with several good movies in order to get them all sewn on. Plus I still have the binding to do so…..
I’ll leave you now with 3 ways to embellish the charming Christmas runner so that I can hopefully get it done before Christmas 2017 and wish you all a happy holiday season. what a great project…it looks lovely! I am particularly a fan of the blanket stitch. This runner is a fabulous project. These are great! Love the smaller projects!